Extron Electronics, a world leading manufacturer of audio visual and conference room solutions, have in the past week announced not one but two exciting updates to their range of collaboration space products. The first announcement from Extron was of the immediate availability of system enhancements and updates to Extron control for Zoom Rooms. 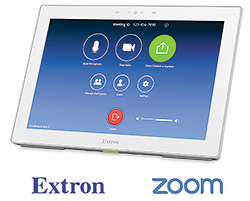 Extron Control for Zoom Rooms gives users the ability to control all AV elements of a meeting room from either an Apple iPad or Extron Pro Series touchpanel. The newly announced updates to Extron Control include improved GUI elements, contact presence information, content sharing, new camera controls, and much more. Alongside the update to Extron Control for Zoom Rooms, the company have also announced that they are to work with tech giants Dolby. 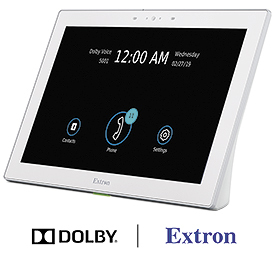 The collaboration will enable the Dolby Conference Phone to operate seamlessly with Extron’s Pro Series AV control solutions. That will extend Extron control capabilities to the Dolby Conference Phone, providing complete AV and conferencing control for the modern meeting space, according to the company’s announcement.